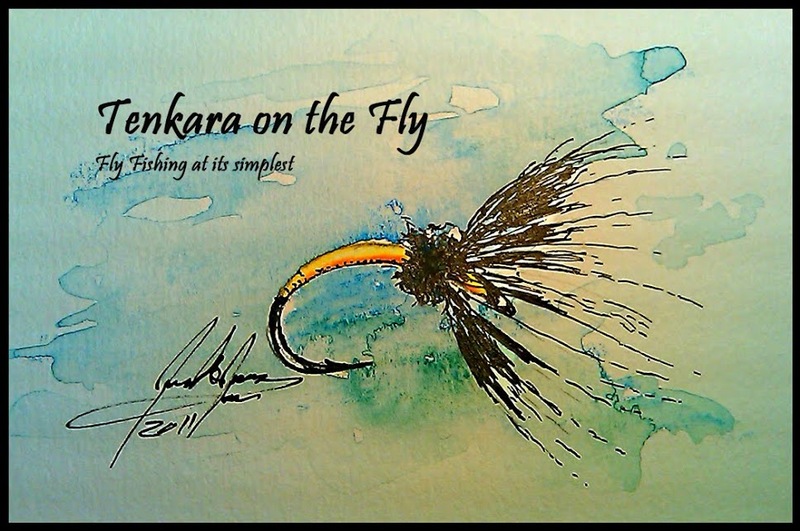 Graham and I have been talking about going Tenkara fishing for a day and decided to invite some friends and to post an invite on the Tenkara USA forum, opening the "event" up to anybody who is interested tagging along. Surprisingly (or maybe not so much), there were quite a few folks that not only wanted to come but also had time to, including some that had no prior experience fishing, fly fishing or Tenkara fishing. Thankfully there were a few "seasoned" Tenkara anglers joining, so we could give instructions to the newbies on a 1:1 basis, equip them with our spare rods, lines and flies. We had a blast fishing yesteday on a local creek, almost everybody caught fish (Jay - I am sure Graham will work on that with you), the weather was beautiful, almost no wind, insects where hatching all day long and we caught trout on tenkara flies, nymphs, soft hackles and dries. For my part, I think I caught all but one fish on either an Elk Hair Caddis or a CDC PMD. Looks like Graham is trying to release another tree. He's getting good at it! Heather landing her first trout. It was a nice little fat brown trout! Well, this outing was a success thanks to everybody's positive attitude and willingness to learn something new - and to share. I am looking forward to the next outing! I know, this review has been overdue for a while, my apologies. You know how life is, it sometimes throws you more than a pebble or a rock in your way, repeatedly. Anyway. As a member of the Outdoor Blooger Network I was lucky enough to be randomly selected to review some camping gear from Coleman. I was thrilled since I had a camping trip to Rocky Mountain National Park coming up over Memorial Day weekend. Unfortunately, the weather forecast was not quite what I expected, adding to the way above average snow pack in the Northern Rockies this year. The last thing I wanted is to take my wife and daughter for their first "real" camping trip when it's cold and wet. The CPX 4.5 equipment can be operated with the battery pack that holds 3 AAA batteries (3x1.5v - get it?) or with the rechargeable battery cartridge. The Mini Lantern is very compact, just about 4" tall and provides plenty of light for within a tent. You can use it standing on it's base or hang it from the roof of your tent. It is water resistant, has a lifetime LED, battery meter, two light settings (75 or 23 lumens) and 26h run time on low and 10h on high. It also has an indicator light to show you when you start running out of juice. The battery pack or the rechargeable battery pack can be easily placed into to base of the mini lantern. Energy Pack and Battery Pack (black). The cartridge in the pic above and the Battery Pack slide into the Energy Pack. The rechargeable cartridge comes with a charger for your outlet at home and a car charger, so you can charge it on the go. Now, this is why I love this system: I go camping far and between, but I am using small electronics every day. So... you can use the Energy Pack (holding the battery pack or rechargeable cartridge) as an USB charger for any of your small electronic devices such as cell phones, MP3 players etc. Simply plug your, let's say, iphone, into the USB slot and you have instantly additional power on the go. And don't forget, you can use both the battery pack or the cartridge in the Energy Pack. I am going on a business trip to NYC tomorrow and the Energy Pack will be coming with me. More talking, surfing, gaming and listening music while waiting for that delayed airplane without having to worry that your Iphone's battery will run on empty too soon. I received the Coleman CPX 4.5 System at no cost from Coleman (www.coleman.com). I am not affiliated with the company and I did not receive any compensation to review the system. This post represent my personal and honest opinion.